Suspense! That’s what brings readers back again and again. If you want your readers to keep reading, you have to give them a reason to go to the next paragraph, turn the page or come back a month later. That’s why I ended my blog last month the way I did. What did happen to Abram? He had the visa. He could come to America right away. Why did he insist on stopping off in Switzerland first? And, most of all, why did he never get to America? Abram tried. He really did. His plan was to go from Beirut to Geneva by train. I just finished looking at a Google Map of the area. I can’t imagine what made him think he could pull it off. He was a Jew, in the middle of World War II. He’d have to travel from Beirut, Lebanon to Aleppo in Syria and then on to Istanbul, Turkey. 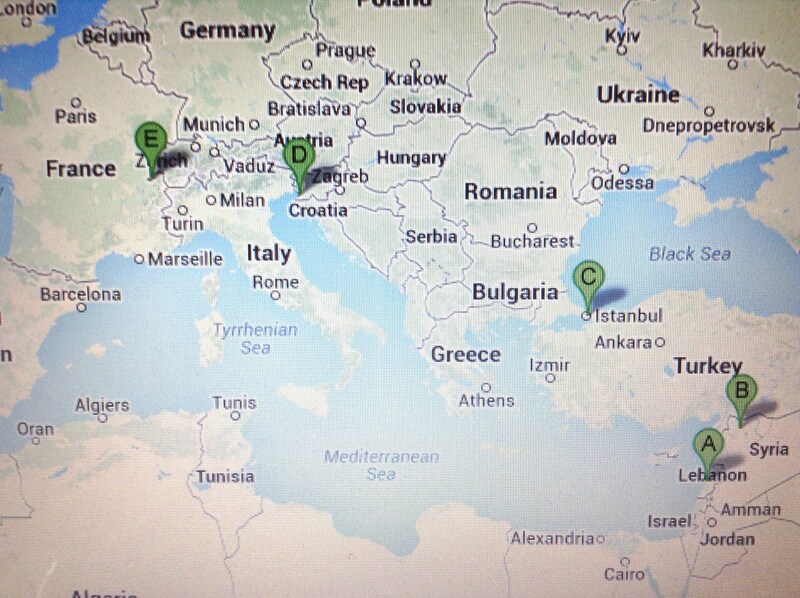 From Istanbul, he’d have to pass through Bulgaria, Serbia, Croatia to Trieste, Italy. Then it would be a relatively short shot to Geneva. I would love to know what he was thinking. How did he plan to do it? Why did he even want to? I wonder, was Abram ever frightened as he planned his journey? Did he feel overwhelmed? Did he worry that he wouldn’t be able to do it? To try to figure out how Abram might have planned it, I did a little research on my computer. If I wanted to make the trip today, I’d have to take a bus or taxi from Beirut (A on the map) to Aleppo (B). That’s 186 miles. Then I’d take the train to Istanbul (C) for 768 miles. After that I’d travel for another 991 miles by train to Trieste (D). From there it would be 450 miles more to Geneva (E) and he would have made it! But I’d be doing it as an American on an American passport. Abram was doing it in late 1941 as a Jew with an American visa that could be dangerous for him to show until he boarded the ship because the countries he was passing through were controlled by the Nazis. Germany’s puppet government in France controlled Lebanon and Syria until the Allied Invasion of July, 1941. Turkey was neutral in 1941 but Hitler had taken Bulgaria on March 1, Croatia on April 10 and Serbia on April 17. Abram didn’t start out until sometime after June. What was he planning to use for papers? What acceptable reason could he give for traveling? How did he disguise himself so he could blend in with the other travelers? How did he get enough sleep and to eat so he could function? The one thing he did have going for him, besides his American visa, was that he spoke a number of languages: Romanian, German, French, English, Italian and probably Yiddish. Looking at the map, I still can’t believe it that Abram made it as far as he did. He must have been very brave, determined and resourceful. He had a lot of guts. He made it most of the way. He was so close. Then he had bad luck, very bad luck. Somewhere on the train between Serbia and Italy some Nazis found him. He had almost made it to Trieste, only half a day’s travel from Geneva. The Red Cross finally found out the truth but not until after the war was over. So for years my parents and Grandma and Papa wrote, telephoned and cabled the Red Cross and anyone else they thought could find Abram and help him come to America. They always believed he was still alive until the night the telegram came. It was a Sunday in 1948 or ’49. There was a knock at our door. It was Western Union. The messenger had gone to my grandparents’ apartment in Pacific Heights first, and when no one answered, their neighbors told the messenger that every Sunday night Grandma and Papa went to their daughter’s house out by the ocean. They gave him the address. The telegram was from the Red Cross. I remember my father coming into the dining room, taking my brother’s and my dinner plates, telling us to bring our glasses of milk, and come with him. He took us to our room, put the plates on the floor and turned on the radio to the “Lone Ranger”. Dad told us to stay in the room, keep the door closed and listen to the program. He’d come back and get us. I remember thinking, this is strange. We were never allowed to bring food to our room or listen to the radio during dinner. Then I heard my Grandmother scream. I can hear it today in my imagination as I write this. It was so loud and so sad and it came again and again, drowning out “The Lone Ranger”. I could hear Papa saying, “Clara, Clara”, over and over. The telegram was from the Red Cross. It said that Abram had taken the train to Switzerland. Somewhere, along the way, just before Trieste, Nazi soldiers had boarded it and found him. When they got to Trieste they took him off and to a hotel room. There they robbed and killed him. All this had happened in 1941. He’d been dead all this time and we never knew. Why, once he had the visa to America, didn’t he come right away? Why did he insist on making this long, dangerous journey to Switzerland first? We may never know for sure. But I don’t think it was what he told the family: He was sick and wanted to see a doctor to help him get well before he came to America. I think he had a much bigger, more important reason, one that would make him, a man in his sixties, a Jew in a world at war, make this 2,395 mile journey first. Next month I’ll write about what I think his reason was. Thank you. I appreciate what you said. I cried when I read what happened to Abram. The full story must be written for more people to read about one man’s journey during those trying times. Claire, you have a gift for holding a reader’s attention. Your use of suspense is working! Can’t wait till next month. Maybe he was in love with someone in Trieste. Daniel Kyle and I visited Trieste and I lived on Trieste for 3 months, called there strongly . When I visited w my family years later, we stayed in the hotel Abrams lived in, the savoia. Daniel had nightmares all night about a murder. Thank you for writing and researching this. Thanks for sharing. This is new information I didn’t know about. I think that this episode particularly highlights the importance and benefits of doing your research. I wonder if the author enjoyed the careful research. I’m looking forward to the next episode. Thanks! I did. That’s how I could see how difficult it must have been for Abram to travel from Beirut to Geneva in the middle of a war. Once I saw the distances on the map & that most of the countries he traveled through were controlled by the Nazis, I knew he didn’t do this because he wanted to see a doctor before he came to America.